The Cold War was well under way in the 1950’s and the two belligerents: the United States and the Soviet Union, longed to expand their respective spheres of influences- with the U.S. focusing on Latin America, while the U.S.S.R. aimed to solidify its “iron curtain” in order to retain influence over Eastern Europe. For the American government, this meant supporting domestic companies that held monopolies in smaller Latin American countries, and especially undergirding a corporation that represented “a fable of American capitalism”. United Fruit Company was the standard bearer for how a small capitalist venture in 1870, started by Captain Lorenzo Dow Baker, could be transformed from a simple fruit trade into a huge trans-national corporate entity which held almost absolute political and economic power first and foremost in Guatemala (and still substantial, but less so in other Central American countries) through backdoor deals with complacent, inept and thoroughly corrupt dictators. General Jorge Ubico was the last of the old dictators before the democratic revolution that went under the name of “The Guatemalan Spring” in 1944, however, before he fell, Ubico was able to deal a fatal blow to Guatemala’s economic sovereignty by signing a ninety-nine-year agreement for an UFCO Pacific coast plantation and granting “the company the kind of concessions to which it had been accustomed: total exemption from internal taxation, duty-free importation of all necessary goods… Ubico, in fact, insisted that laborers be paid a daily wage of no more than fifty cents in order to keep other Guatemalan workers from demanding better pay”(pg. 70). In Bitter Fruit, Schlesinger and Kinzer thoroughly hammer the point that United Fruit Company held high stakes in Guatemala. UFCO invested immense amounts of money and manpower in public relations stunts so that the American people and government would be concerned with the corporation’s Latin American interests as a nationwide issue that needed the public’s attention and the Truman (then Eisenhower) administration’s protection. Once democratically elected Guatemalan president Arevalo announced future land reforms in order to benefit impoverished peasants, UFCO hired Edward Bernays as a spokesperson for the company. The “PR” expert subsequently led mostly liberal American journalists on a carefully orchestrated trip to Guatemala so he could show off the company’s paternalistic, supposed benefits to locals and make a point that increasing communist subversive activity in the country was responsible for labor antagonisms, not legitimate union concerns. Schlesinger and Kinzer focused on the fact that some officials both in the U.S. State Department and the CIA had owned stock in UFCO holdings and how some even moved on to work for the company after they had left government positions. Senator Henry Cabot Lodge from Massachusetts (UFCO’s home state) instigated congressional concern for the company when the congressman “whose family owned stock in United Fruit, strode onto the Senate Floor in 1949 and denounced the [Guatemalan legislated] Labor Code for discriminating against United Fruit and forcing the corporation into a ‘serious economic breakdown’ through labor unrest”(pg. 83). Bitter Fruit’s focus on the correlation between United Fruit’s lobbying to hold onto economic power in Guatemala and U.S. government interest in preventing the spread of Communism in its “backyard” is thematic in that by 1954 the two interests became one and the same. Schlesinger and Kinzer were able to uncover corporate and government collaboration through mostly domestic sources with only some Guatemalan participation that was necessarily anonymous due to continuing internal strife throughout the war stricken country; even while they were writing Bitter Fruit in the late 1970’s. Howard Hunt was the CIA director of misinformation during the U.S. backed “Liberation” coup against Arbenz in 1954, and he was an important source for the authors: since propaganda played a major role in Castillo Armas successfully carrying out the coup. In particular, Hunt was insistent on UFCO’s involvement as the catalyst for the CIA funded and organized endeavor, and Schlesinger and Kinzer’s thesis was that if UFCO had not existed, then the American government would have had less interest in toppling the democratically elected revolutionary government in Guatemala. However, the situation was aggravated by Arbenz’s tolerance of, and minimal influence from Communist party members, and Bitter Fruit implicated that the Truman administration had no interest in directly intervening in Guatemalan affairs for United Fruit. But the authors explicitly stated that once the Eisenhower administration took power (along with the advent of McCarthyism) the death knell for democracy in the Central American country grew significantly louder until “the North’s” intervention was imminent. Overall, Bitter Fruit focused on the American perceived communistic outlook in Guatemala as the justification for the eventual coup, yet argued that this perception was started by United Fruit’s propaganda and Schlesinger and Kinzer verified their point by unveiling the American government’s involvement with UFCO representatives through sources revealed by the Freedom of Information Act. 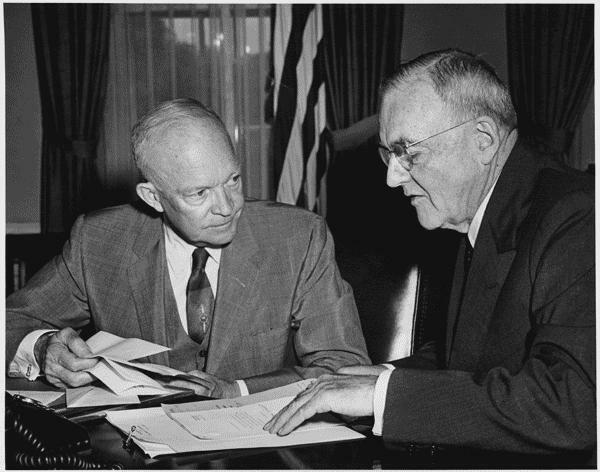 President Eisenhower and Secretary of State John Foster Dulles. Dulles was adamant about “containing the spread of communism”.